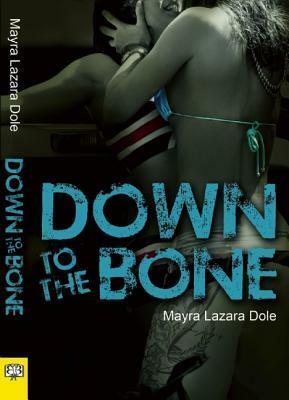 2 years ago, I reviewed Down to the Bone by Mayra Lazara Dole with Rie, another book blogger. Recently, I was contacted by the author about reviewing the newly expanded, updated edition of the book published by Bella Books. Because it was a couple of years ago since I read it the first time, I wasn’t able to tell exactly which parts had been changed (which is good, I guess, or else there would have been parts that didn’t match). The tone of the book is very much the same, however. I remember reading it the first time and feeling like there was a dreamy element to the book, like it all took place in one hazy blur. It took me a little while to get into the writing: the present tense occasionally distracted me, some of the dialogue didn’t ring true, and there’s just some general quirks in the style. Once I got used to it, though, the writing style swept me along. It really seems to be true to Shai and her life. There’s lots of Cuban phrases and culture included, and a lot of it feels like you are inside Shai’s head. The real strength of Down to the Bone is in the characters. Although sometimes they seem too quirky to be true (Shai and her friends have a list of interests a mile long, including water sports, environmentalism, architecture, foreign movies, drawing and painting, landscaping, specific music, etc), Shai and her friends are very lovable. I do remember that people seems to flit in and out of the book in the first edition I read, whereas there’s a lot more closure on relationships (specifically Marlena) in this edition, which I definitely think is an improvement. Tazer, Soli, and Viva especially are really interesting, well-rounded characters that you couldn’t help loving right alongside Shai. Despite my difficulties with the writing sometimes, I can’t help liking Down to the Bone. The characters are so strong, and I love the Miami Cuban culture that permeates through the whole book. It also is a story that tackles not being accepted by your family, but also finding love and family in different people. Even when I disagreed with her choices, I was always sympathetic with Shai’s struggles to stay true to herself while maintaining relationships with her friends, love interest(s), mother, and little brother. Not a lot of teen books really take on the idea of being kicked out, which unfortunately is a reality for too many queer kids. This book is a respectful look at some of the challenges of this, while still being upbeat. Shai is always loved and supported, even when her former friends and her mother turn on her. I also like that there’s a genderqueer character in the novel. The first time I read Down to the Bone, I was unsure of the treatment of this character. This time around, I feel like Tazer got a little more attention. I was a bit confused at first, because Tazer says that he is genderqueer, and then Shai immediately switches to male pronouns and talks about Tazer as if he is a trans man for most of the book, but eventually there is a scene where Tazer revisits that he is genderqueer/a boi, which smoothed it over, I thought. Looking back at my conversation with Rie, I think the major changes I noticed in this expanded (? it doesn’t seem to be more pages) edition is that things don’t seem to zoom along at the same breakneck speed I remember the first time around, and characters don’t suddenly appear or disappear from this version. It does seem to be a neater story, despite having that dreamlike quality. (Also, now that I look at it, that they have different names: Shai vs Laura.) Overall I still find this to be a sweet, and important queer teen story, and I’d recommend it to YA fans, especially if you’re looking for something different from the usual white, middle-class lesbian coming out story.